I have been plugging away on my Christmas Cards for this year and have about 10 completed; all unique of course. 🙂 It would be easier to make the same cards for all but, what fun would that be? Interestingly enough, I have been using more embossing powder and glitter than I normally do. Loving the sparkle and pizazz these materials bring to my cards. ‘Tis the Season for it, I suppose. Plus, with all the tumultuous world events going on these days, adding a little shine to life is certainly not a bad thing! 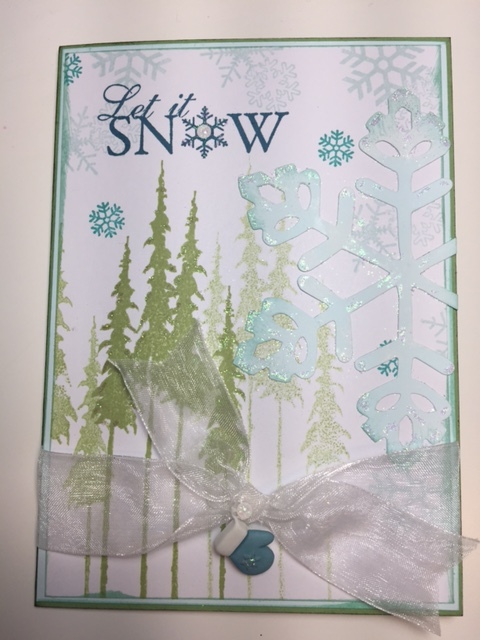 The card included in this post is one of my favorites (so far); using stamps, die cut, glitter, ribbon, sprinkles and a button…this simple card has about everything! This next week I will be trying out a technique using acetate with embossing powder and glitter. So, stay tuned for upcoming instructions and card recipes.